Equipped with convenient functions that the guide tells the fishing point! You can enjoy the battle easily by simple operation for beginners! Let's enjoy Open Sea Fishing! Prepared two guides: beginner and expert. By hiring a guide, you can find a fishing point where fish live! Prepare for the fight with fish in reference to the guide's advice! Added a concept of oil quantity for moving a boat! Let's start on a voyage considering how much quantity will pile according to purpose! Fighting is a one-to-one match with fish! Your strength may exhausted, or landing a fish may success. The result of them depends on your ability! For getting a Big fish, it is necessary to elaborate tackle systems. Save coins and buy new items in the shop! Let's challenge with fishing tackles depending on the fish! There are 16 types of fish includes in this app! There are 5 types of MAP and the fish differs depending on each MAP. Equipped 2 modes to enjoy fishing. The first mode is Mission Mode that the completion condition is specified. The various completion conditions appear such as the types of fish and the total weight! A huge boss fish will wait for you in the last mission on each MAP! 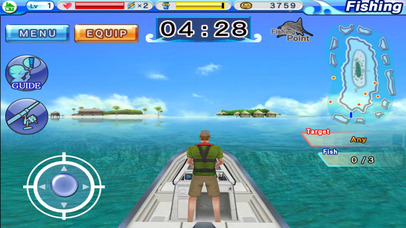 The second mode is Challenge Mode that the more you catch a fish, the longer the time limit will be extended. On each challenge mode, there are some lucky fish to get various types of bonus. 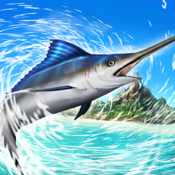 Catch a fish according to circumstances, and try to aim at high score! Game Center is compatible with the data about the fish weight you've caught in each mode and the score in the challenge mode. Compete with all players in the world!